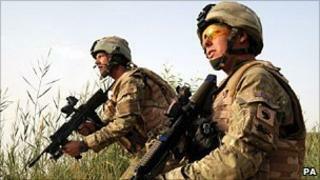 The Ministry of Defence is seeking to find more savings from the armed forces in the next financial year. A three-month study, reporting in July, will consider which personnel and equipment programmes could be cut. Last October's strategic defence and security review set out plans to scrap HMS Ark Royal and the Harrier fleet and cut 42,000 forces and civilian jobs. The MoD said it was assessing whether spending assumptions made in the past were still affordable. Last year's review outlined the future shape and size of Britain's armed forces with defence spending set to fall by 8% over four years. The RAF and navy will lose 5,000 jobs each, the Army 7,000 and the MoD 25,000 civilian staff. Among the other cuts announced was the scrapping of the new Nimrod surveillance plane. The MoD says the strategic defence and security review is not being reopened, but after completing the planning round for its budget for the financial year ending in March 2012, its work for next year has already started. The MoD says the new study is part of work being done to ensure it matches its planning assumptions with its spending settlement, and closes the gap between the two. A spokesman said: "We have made it clear that while the strategic defence and security review had made substantial inroads into the £38bn funding deficit, there is still more to be done." BBC defence correspondent Caroline Wyatt said potential targets for spending cuts could include HMS Illustrious, the UK's last surviving aircraft carrier, which is due back from a refit next year, as well as plans for a new fleet of armoured vehicles. Jim Murphy MP, Labour's shadow defence secretary, said the development amounted to a "startling admission from government that the defence review was not fit for purpose". "Last year ministers claimed to have a long-term plan for defence, but just 28 weeks later there is an unseemly scramble to plug the serious financial holes in their plans," he said. "At a time when the chief of defence staff has called on the government to 'up the ante' in Libya and the heads of the Army and the RAF have said their services are 'running hot', the country will be shocked that the MoD are preparing to make deeper defence cuts." News of the MoD study comes as Defence Secretary Liam Fox prepares to address Parliament later on amendments to the Armed Forces Bill that will see principles of the military covenant - the nation's duty of care to personnel - written into law for the first time. It is understood that measures to improve soldiers' welfare in areas such as health, housing and education for forces' children will also be revealed.